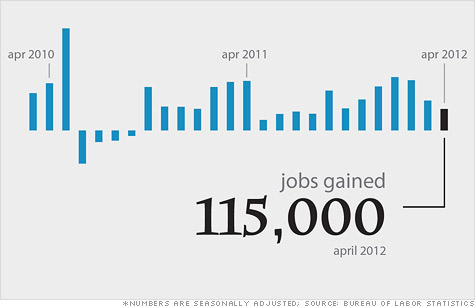 Click the chart for more data from the April jobs report. NEW YORK (CNNMoney) -- Hiring slowed in April and workers dropped out of the labor force in droves -- not a good sign for the job market going forward. The economy added just 115,000 jobs in the month, the Labor Department reported Friday, down from March when employers created 154,000 jobs. Meanwhile, the unemployment rate fell to 8.1% as 342,000 workers dropped out of the labor force. At 63.6%, the portion of the working-age population participating in the job market is now at its lowest level since 1981. That's problematic mainly because it weighs on economic growth. "If there are less people working, then your potential for what the economy can produce is reduced," said John Silvia, chief economist at Wells Fargo. The labor market has been on a roller coaster this year, with job growth starting off strong in the first couple of months of 2012. Then a disappointing slowdown in March led many to wonder whether the recovery was taking a turn for the worse. April's weak growth compounded those fears. But revisions from previous months also showed the economy gained 53,000 more jobs in February and March than originally thought. Some economists believe the slowdown now is mainly due to the seasonal adjustments the government uses in calculating its figures. Warm weather earlier in the year may have given the job market an artificial boost in January and February, which is now tapering off. "This is payback in terms of the weather," Silvia said. Retailers added 29,000 jobs in April, while restaurants and bars added 20,000 workers. Temporary agencies hired 21,000 and manufacturers added 16,000 jobs. Meanwhile, the government continued to slash workers. Recruiters say they're still seeing plenty of demand for high-skill workers in technology, health care and professional services like accounting, but not enough of America's unemployed have the right qualifications. "Companies are changing and innovating, and therefore the jobs that they need are changing," said Kathy Kane, senior vice president of talent management at Adecco Group North America. "The hardest part for us right now is to keep up with those changes and find the workers with the skills for the new jobs, not the old jobs." Indeed, workers with a bachelors degree or higher have only a 4% unemployment rate, while those with just a high school education have a 7.9% jobless rate. Overall, the job market has a long way to go to climb out of the deep hole left by the financial crisis. Of the 8.8 million jobs lost, only about 3.7 million have been added back. Roughly 12.5 million Americans remain unemployed, and 41.3% of them have been so for six months or more.